We spoke to Christopher Haydon about The Convert and his journey with the production as its director. What was it about this play that made you want to stage it at the Gate? There are so many things that drew me to this play. We had a great time producing Danai’s last play Eclipsed – it had been such a hit that it felt appropriate to bring her work back in my final season at the Gate as Artistic Director. I also feel very strongly that we, as a country, have never really taken a serious look at our colonial history. You can see the consequences of our empire all over the world today – from the refugee crisis to the Middle East conflict. Also, when I was a student I read Frantz Fanon’s remarkable book Black Skin White Masks and was really struck by his arguments about how indigenous populations often internalise the values of their colonial oppressors. Danai’s play is a brilliant depiction of this phenomena. Of course, the play is also incredibly moving, it has a great sense of humour and it allows each of it’s characters total autonomy – they are all flawed, we can admire and abhor them at the same time. They are really meaty roles for actors and it has provided me with the opportunity to work with some of my favourite actors and to develop something really special with them. 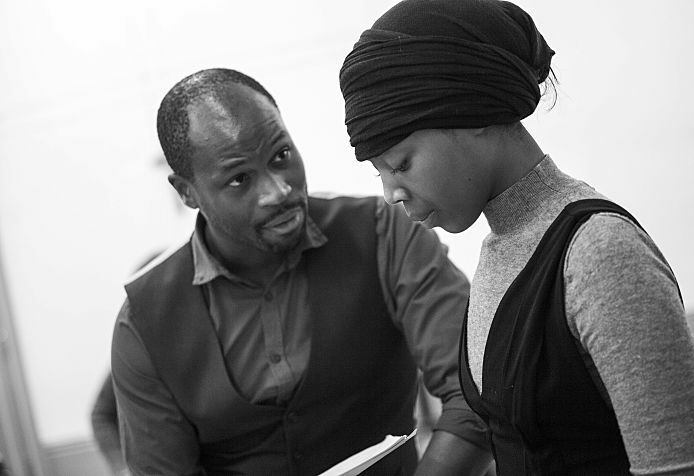 The play is set in 1896 Rhodesia, what were the challenges you faced in recreating this time for The Convert? Often when I am rehearsing and designing a show, I start with pictures of the time and place it is set. But there are relatively few images that are easily available of this specific place and so we had to dig around quite a lot to find the appropriate visual references. Also, I think, at first, that I shied away from the ‘Africanness’ of the play. I use that word advisedly – my fear was that it would drift in to cliché but the risk on the other hand was that the whole thing would just feel a bit too English and toothless. When I was speaking to Danai, who is Zimbabwean, she really pushed me to make sure the show took total ownership of this and really embodied those very different traditions and modes of behaviour. We spoke with a number Zimbabweans who had real expertise in the history and culture of their country and this had a huge impact on how the actors play the show – you can see it in their bodies, their gestures, their voices. Also, the play requires some very specific props – snake skins, monkey jaw bones and other things like that. Sourcing those was a challenge! Because it is really moving as well as being very funny. And the actors are giving really visceral, gripping performances. Array (  => Array ( [id] => 165 [created] => 1485183660 [updated] => 1485183660 [ordering_count] => 158 [intro] => Christopher Haydon discusses working on The Convert. [title] => The Convert: Director's Vision [slug] => the-convert-directors-vision [category_id] => 12 [body] => We spoke to Christopher Haydon about The Convert and his journey with the production as its director.